Turmeric is a spice that comes from a tropical herbaceous plant. It can be grown only in tropical conditions. Most gardeners who want the spice will grow it indoors or in a heated greenhouse. The spice is produced in the rhizome of the plant that resembles that of the ginger rhizome. 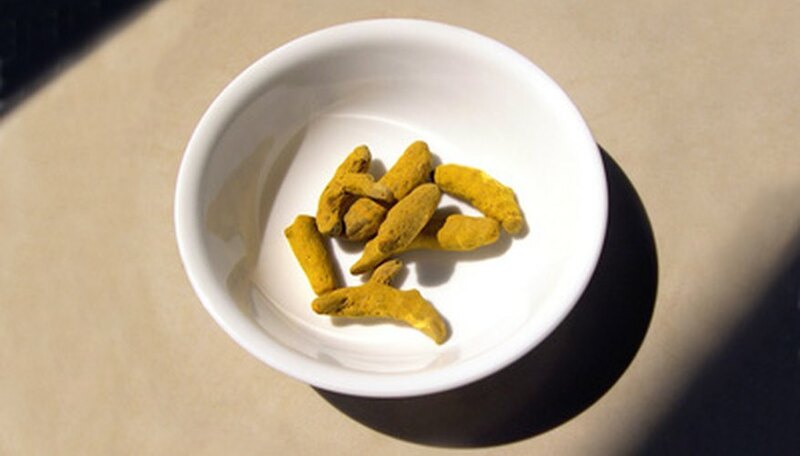 Turmeric is started with fresh roots, which can be found in some health food stores, nurseries or online. It normally takes eight to 10 months to produce a rhizome that can be harvested. Mix 1 part compost with 1 part sand. Fill a seed tray with the mixture. Place the rhizome root side down on the soil and just cover the roots. The tooth like bud should be facing up. .
Watch the rhizomes for shoots after the first week. Remove the bag when shoots appear. Keep the soil damp but not soggy. Place the tray in a warm location with indirect sunlight. Plant the turmeric in a 6-inch flower pot filled to within 1 inch of the top with a 50-50 mixture of potting soil and compost when they reach 2 inches tall. Locate the pot in a slightly shaded area, but keep it warm and out of drafts. Give the plant more sun as the weather gets colder. Water the plants to keep soil moist during the spring and summer. Allow the soil to dry on top between watering in the fall. Keep the plants slightly dry over the winter. Apply a general purpose liquid fertilizer weekly during the spring and summer. Follow the manufacturer’s directions on amount to use. Mist the plants twice a week during hot, dry weather or when heat or air conditioning are being used in the home. It may take as much as three weeks for the rhizome to start growing. Home Garden Landscaping Tips: How to Grow Turmeric.